Let us show you the world famous Bondi Beach! This is our most extreme adventure. Leave the shelter of Sydney Harbour and be taken on a high speed adventure south along the coast to one of the world’s most recognised beaches. Private Bondi Bash Rides are available for groups from 1 to 21 passengers. We can also pick you up and drop you back to virtually any wharf in Sydney Harbour. Perfect for Bucks/Hens Parties, Corporate Activities, Team Building Events etc. Forget boring old whale watching cruises! 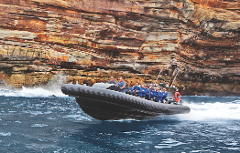 Ocean Extreme is proud to offer the most personal and most exciting Whale Watching experience, there’s just nothing else like it in Sydney. Depart direct from Manly Wharf.